Deerfield Beach – Faye Adam’s story is about thave a happy ending. Her tenaciousness and ability to cope for 12 years with angeand frustration that wouldhave felled most people, will have its reward. She moves back into her completely renovated Century Village East condominium this week. Hanging on a wall will be her certificate of occupancy framed for her by her contractor. The saga began in 2005 when fire swept through Ventnor B, set off by an old ceiling fan. It consumed 10 of the 20 living units because the building’s firewalls in the attics had not been repaired after cable was installed. Three months later, Hurricane Wilma struck causing severe water damage to the units. The “perfect storm” of disasters set up what may be one the lengthiest battles on record pitting residents against their condominium association, cable companies and insurance carriers. Ventnor B was grossly underinsured. The insurance company went bankrupt after Wilma. And, adding thousands of dollars to the cost, the building had to be brought up to much stricter south Florida building codes than when it was built. In the meantime, the residents had to find other lodging but continued to pay condo fees and their mortgages. Some could not, so the units reverted back, in unsaleable condition, to the condo association. In the years she was out of her home, Adam lived in a friend’s unit in Ventnor B enabling her to remain on the condo board and keep up the good fight. Faced with no money to make repairs, the condo board sued Century Village’s Master Association for negligence in overseeing the cable installations and attorney Joe Garrity began a laborious legal process. In June 2016, Master Management settled for $1.9 million. Early on, the state insurance fund had reimbursed the Ventnor B Condo Association $178,000. Adam first came to the Pelican with her story in 2009 four years after the fire. At that time, the condo board needed $500,000 to get the building exterior repaired so the owners could rehab their units. 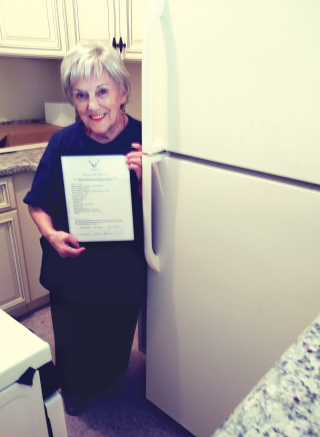 Faye Adam in her new kitchen with framed certificate of occupancy. With costs escalating, “There was never enough money, [for the repairs],” she said. A host of things came into play: because the building was not fully occupied, the insurance rates soared. After a time, residents stopped paying the HOA fees. Claims against the insurance company and the state had to be settled before the lawsuit with Master Management could be filed. Neither of the cable companies involved would take responsibility for the firewall breach. Through all the legal maneuvers, Adam remained resolute in her position that those entities would make Ventnor B financially whole again. “Without her persistence, Ventnor B would still not be repaired,” Garrity said. In the end, the lawsuit with Master Management benefitted all the 242 condo associations in Century Village with faulty firewalls. In a separate settlement, the company paid for all the repairs. That legal entanglement resulted in another major change in the Village. Now, each condo association can purchase its own insurance policy. Adam is 87 years old now and president of the Ventnor B homeowners’ association, a position she held previously for many years after moving here in 1994 as a widow. Last week, Condo Craze radio host Eric Glazer awarded her with the “Board Member of the Year” plaque; a salute to her perseverance. Fourteen of the 20 people displaced by the fire and storm have died, but Adam is optimistic that the building will prosper again. Unfinished units are selling for $45,000. “Buyers are paying the asking price,” Adam said. Three doors down, her neighbors are renovating their unit with trendy touches: a kitchen island, custom bathroom vanity, the addition of a front entry closet and a screened balcony furnished for relaxation. Adam’s unit still lacks some finishes. She is most proud of her bisque-colored kitchen appliances and cabinets. Her travails seem to have hardened Adam. She is not fond of the word “old” and last year after a medical emergency, went off all her medications, a move she believes has vastly improved her health. “Life is good,” she said. “You gather wisdom as you go along. You need the past to know what needs correcting in the future. “You have to let the anger go. But sometimes, you have to be unlike yourself in order to be heard . . ."